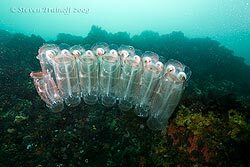 Salps are barrel-shaped, free-floating tunicate. They move by contracting their bodies, which causes water to pump through their gelatinous bodies. They strain the pumped water through their internal feeding filters, feeding on phytoplankton. 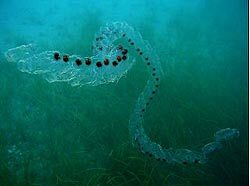 Salps are found in equatorial, temperate, and cold seas, where they can be seen at the surface, singly or in long, stringy colonies. They are most abundant in the Southern Ocean (near Antarctica). Salps have a complex life cycle, showing alternation of generations. The larvae are quite different from the adults, but both are mostly-transparent, tubular, gelatinous animals that are typically between 1 cm and 10 cm long. 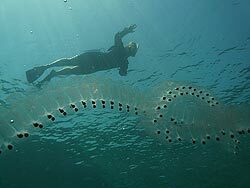 Salps can breed very quickly so when phytoplankton is abundant there are fairly short-lived blooms of salps, which eventually feed on most of the phytoplankton until there is no longer enough food to support the large numbers of salps. 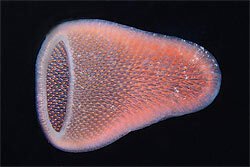 Pyrosomes are free-floating colonial tunicates that usually live with plankton in the upper layers of the open ocean in warm seas, although some may be found in deep water. They form cylindrical or cone-shaped colonies made up of hundreds to thousands of individuals, known as zooids. Colonies range in size from less than one centimetre to several metres in length. Each zooid is only a few millimetres in size, but is contained in a common jelly-like tunic that joins all of the individuals. Each zooid draws in water from the outside to its internal filtering mesh extracting the microscopic plankton and then expels the filtered water to the inside of the cylinder of the colony. 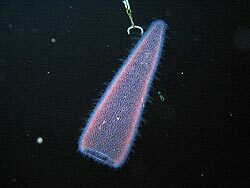 Pyrosomes are brightly bioluminescent, flashing a pale blue-green light that can be seen for many tens of metres. 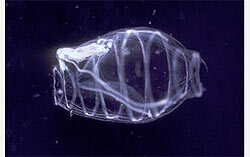 Doliolids are small marine animals of the Tunicata phylum, related to salps and pyrosomas. Doliolids are free-floating filter feeders. They force water to flow through their bodies to gather plankton. This can also be used for “jet” propulsion and can move quite quickly. They grow to around 1 or 2 cm in length. They are barrel-shaped with two wide siphons, one at the front and the other at the back end, and eight or nine circular muscle strands reminiscent of barrel bands. They have a complicated life cycle consisting of sexual and asexual generations. They are nearly exclusively tropical animals, although a few species can be found as far to the north as North California. together to make luminous chains up to fifteen feet long!